#AmitabhBachchan unveils “Badumbaa” from comic caper #102NotOut and urge fans to post their entry to the actor himself. Badumbaaa is a high energy song is sung by Amitabh Bachchan & Rishi Kapoor. And participate in the Badumbaa dance step competition to meet Big B. The full will be out on 19th April. 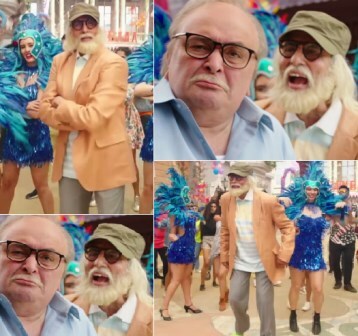 102 Not Out, is an ageless comedy that brings together Indian Cinema’s two biggest stalwarts-Amitabh Bachchan and Rishi Kapoor after 27 years, with the two legends playing father-son duo for the first time. 102 years young Dattatraya Vakharia (Amitabh Bachchan) lives life to the fullest and wants to break the record of oldest living man- that’s held by a 118 years old Chinese. Dattatraya wants to live a stress free life in order to become the oldest living man. However, there is only one hinderance- his 75 year old son Babulal (Rishi Kapoor) who has resigned himself to a life of old age stuck in drudgery. Dattatraya now must find means and ways to change Babulal’s sad and grumpy demeanour so that he doesn’t become a deterrent in breaking the record. Sony Pictures Releasing International presents, 102 Not Out in association with Treetop Entertainment and Benchmark Pictures. The film is directed by Umesh Shukla. The film release on 4th May 2018.